Location: Portsmouth is on England's south coast between Southampton and Chichester. The Bowlplex is on Portsdown Hill which overlooks Portsmouth to the North. It's located at the far eastern end of the road which runs along the hill. Not an easy place to find, the Bowlplex. It sits besides the busy A3M motorway but unless you know the way, it's hard to reach from there. It sits in what is optimistically called a "Retail Park". Actually there's just the Bowlplex and a Homebase, but "Retail Pair" didn't sound quite right I guess. 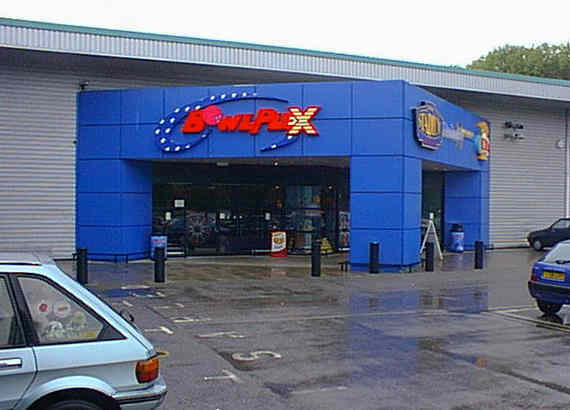 Like many sites, the Bowlplex used to be better for pinball fans. A couple of years ago there were 4 pins in the side pool hall. This was a great place to play as it was well insulated from the hall's main activities, and being part of the bar it was for over 18's only. Unfortunately, it was also well hidden from passing trade so unless you knew the pins were there you wouldn't see them. 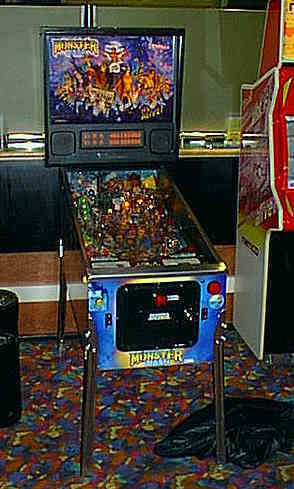 The old pins were classic games rather than ultra-modern ones. Games such as Whirlwind and The Addams Family could be found here. These were supplied by Pinball Paradise just up the road in Borden, so they were in very good condition. Sadly things have moved on and the Bowlplex has cut the numbers and moved the games into the spotlight. Upon entering the building, on your right by the service counter is a South Park machine. The game looked to be in good condition, although it wasn't played on this occasion. The warning sign atop the game is present, though the Cartman model isn't. Game pricing at the Bowlplex is on the high side. The South Park costs 50p per game with no breaks for inserting more. One pound only gets you two games. 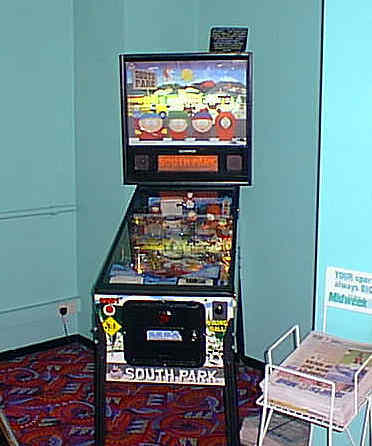 South park takes cash as it's not strictly part of the arcade. All the games in the arcade are token operated with one token costing 50p, but you have to buy multiples of 2 at one pound. Carry on past the front desk and you reach the arcade part of the complex. There are a couple of Pool tables in the centre with games around the edge. Nestled in amongst them is a Monster Bash. This one operates on tokens, so although it costs the same as the South Park you have to bear in mind that there's no point leaving with any tokens. The Monster Bash is in excellent condition and plays nicely. The only real problem is the tendency for the scoop to eject the ball straight down the middle. It only does this about 10% of the time, but you have to be aware of it. The Mosh Pit lane very occasionally fails to register and the outlane adjusters are set as wide open as possible but these niggles aside the game is very clean and fast. Replay base is 30M which is very achievable, so you shouldn't get through too many tokens. It does climb fairly quickly though. Grand champion at the time of writing is 515M. The scoring on Monster Bash is quite unbalanced. Building up to the 2 wizard modes doesn't score that much but the Monster Bash mode should about double it, and the Monsters of Rock do the same again. An average game might score about 80M, another 80M for MB and another 160M for MoR. During the day the Bowlplex is very quiet so there's no problem in getting a game and the sound of the bowling isn't obtrusive, though the large Namco game on the right is cranked up quite loud. The lighting in the arcade area is nice and dark and there are no nasty reflections. So in all, once you've found the Bowlplex there is some good pinball playing to be had. Update: The South Park pinball machine has now gone, though the Monster Bash remains.